The walls that keep us in and the walls that keep us out: Rafaella Marcus reviews Clean Break’s double bill in Edinburgh. House at Assembly George Square, Edinburgh. There has been a profusion of shows about housing this Edinburgh: how difficult it is to acquire, and how fragile once got. This deeply felt double bill from Clean Break adds two new voices to the outcry, Somalia Seaton’s House and Chino Odimba’s Amongst the Reeds. Both are concerned with the tangibility of buildings, how solid walls can keep you trapped inside, or keep others out. In Seaton’s House, we bear witness (and it does feel like we are bearing witness, the play opening with gospel chords sung in prayer and hope) to Patricia’s return home. She’s been away, she feels – or her mother feels she is – tainted by the world, she brings the outside in with her. Seaton’s writing is at its sharpest in reminding us how much a house is – as Luther Vandross put it – not a home, though it can be as confining as the institution Pat has spent time in. At times, House feels a bit like the play an emerging writer needs to get out of their system: it is raw and heartfelt, but occasionally crunches the gears, lurching towards melodrama and receding again. Once the revelations start coming, they come thick and fast but a strong, elastic performance from Shvorne Marks keeps Pat the right side of being a cipher for her experiences. Rebecca Omogbehin is striking as the younger sister Jemima, both delicate and blundering, while Michelle Greenidge brings home all the immovability of unswerving faith as the girls’ mother, along with the poignant suggestion that her intransigence is born of the need for survival, both for herself and her daughters. Róisín McBrinn’s direction offers some nicely complicating touches: in Pat’s first two shimmering, dream-like monologues, she speaks into a children’s tape recorder, as if experimenting with placing herself on the record for the first time. By the end the recorder is discarded, she has put away childish things and speaks to directly to us unmediated by the dictates of her past. It is a lovely reflection of the way the play’s naturalism is soaked in memory, the past unfolding alongside the present. Seaton is concerned with a lot of things: poor provision for mental health, the hazards of religious faith when it turns toxic, the unwillingness of families to alter their status quo, teenage pregnancy, abuse, insularity, the tricksiness of memory. Any one of these would be an interesting thread to pull on, and it does feel like there is a further blossoming of this play still to come, but there is too much trying to fit through the door at once. Odimba’s Amongst the Reeds is formally the more interesting of the two, an experimental recurring nightmare in which two immigrants living under the radar, desperate for refuge but unable to seek it from the state, hide out in an abandoned building. Their moment is driven to its crisis by the imminent arrival of the heavily pregnant Gillian’s (Jane Le) child, a birth Oni swears she can help with. Oni (Omogbehin again, in the second of two standout performances) appears as the Artful Dodger to Gillian’s Oliver, dazzling in a sequinned jacket and neon leggings, and like Dodger ultimately cuts a tragic figure, caught in her own determined spin, faced with the prospect that she needs her charge more than her charge needs her. Oni and Gillian replay the dialogue of their first meeting until it becomes a mantra of co-dependence, a memory as hardy and untouchable as folklore. Odimba’s piece eloquently presents us with the legal bind its protagonists find themselves in, the narrowing of their whole world to the comparative safety of their makeshift home, the way they become night creatures, building their home in the dark, inhospitable places that no-one else wants. But the piece is just as fascinating on the way people become stuck in holding patterns, especially when a lack of finances or resources means they can’t get out: in their blind insistence that some outside helping hand will miraculously appear, Oni and Gillian might be the descendants of Vladimir and Estragon, or even the frozen couple of Jon Fosse’s Someone is Going to Come. McBrinn makes the most of the fractured sense of time, Gillian appearing and disappearing in various stages of pregnancy like a muddled time lapse flower, but by its nature, the play’s repetition and lack of progression eventually become more frustrating than illuminating. The overall sense is of potential, two writers finding their feet with weighty subject matter. At ninety minutes in total, both are slightly thwarted by the necessary running time for an Edinburgh double bill; I easily could have watched another act of both and an extended running time might have given them the space to resolve themselves more satisfactorily. 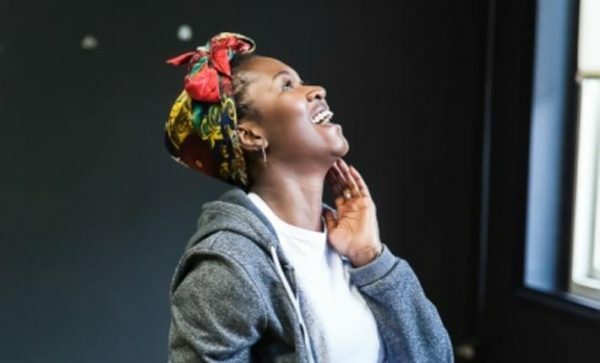 Seaton and Odimba have come out of Clean Break’s Emerging Writers’ Programme, designed to support emerging BAME voices. Among other things, it is heartening to see a playwright development scheme that follows through to a commission and full production: we have a glut of opportunities that encourage new plays to be written, and comparatively little provision for them to be staged. It is also fantastic to see a stage populated by four uniformly strong BAME performers: while the gender gap is closing at the Fringe, it remains stubbornly white. The double bill will now transfer to The Yard in Hackney; it’s worth a visit to hear two new voices starting to sing.